It was a fun event with guests from a few months of age to +98years(!) spilling out on to the quaint Library Street of the historical town of Victoria. The exhibition will extend until 7th July. Everyone is welcome. Over the years I have noticed it can be a feat preparing and taking the 30minute journey ‘over seas’ from Malta to Gozo; yet always rewarding! Crossing the channel by ferry and passing thru the valley to Victoria the tranquility immediately hits me and I say, ‘Imagine Malta once used to be like this’. One travels to Gozo maybe a few times a year on a weekend break to experience Nature and tranquility – but is it not possible to connect our everyday lives with nature? Could we contain our buildings like the Citadel leaving space for children to run and explore in the fields? Could the wide roads leave space for bicycle paths in the countryside? Could our daily lives rely less on commuting by car and instead we could stroll through the meandering townscapes? 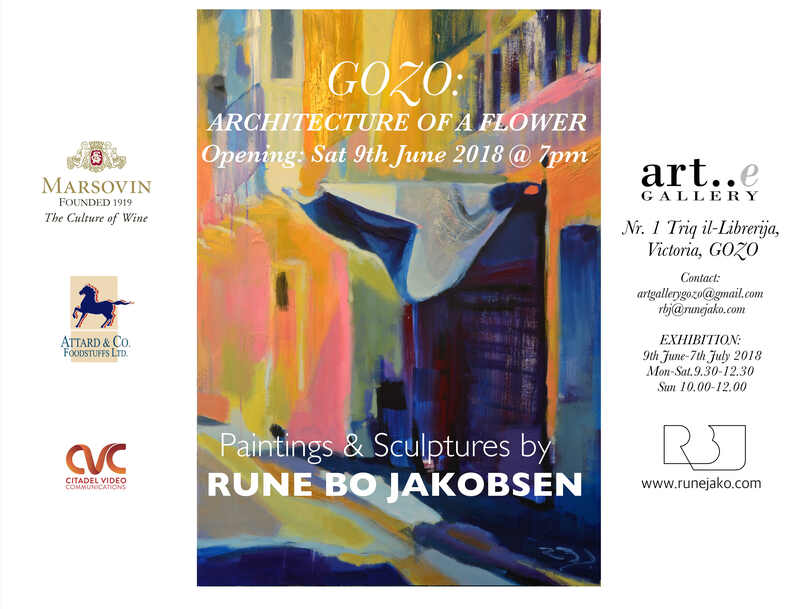 ‘Gozo: Architecture of a flower’ seeks to open our eyes to the beauty of Nature big and small; a Nature which with the rapid development and urban sprawl is becoming more and more rare in Malta – and now also affected in Gozo. This exhibition has been an exploration, seeing the beauty of Gozo: with it’s golden cliffs, green valleys, purple skies and how a few serene townscapes still co-exist in harmony with the surrounding landscape. From the magnificent cliffs to the delicate flower perched on it, the Nature of Gozo has inspired me. Over the past year I have explored and experimented; learning from the landscape and studying the folds of ‘Fungus Rock’ cliff faces to the folds of a flower. I also discovered a transparent cloth-like material, which is used in Malta to sift gunpowder for fireworks. Folding this shiny brass netting and in architectural terms translating the geometry of the intricate ‘Snap Dragon’ flower into a series of origami-like sculptures. Like my 2013 concrete ‘Popcorn’ series these have a soft, approachable aspect whilst embodying stages of growth albeit being rooted and perched in harsh limestone surroundings. In my Gozo paintings the focus is also on folds: outlining the edges whilst unveiling the colours in the shadows of the Gozitan landscapes and townscapes. Finally, a new route has also begun to emerge in the latest pieces: creasing composition paths diagonally across the canvas joining the sky with the landscape. In paintings with seascapes these paths are becoming shimmering constellations of light.